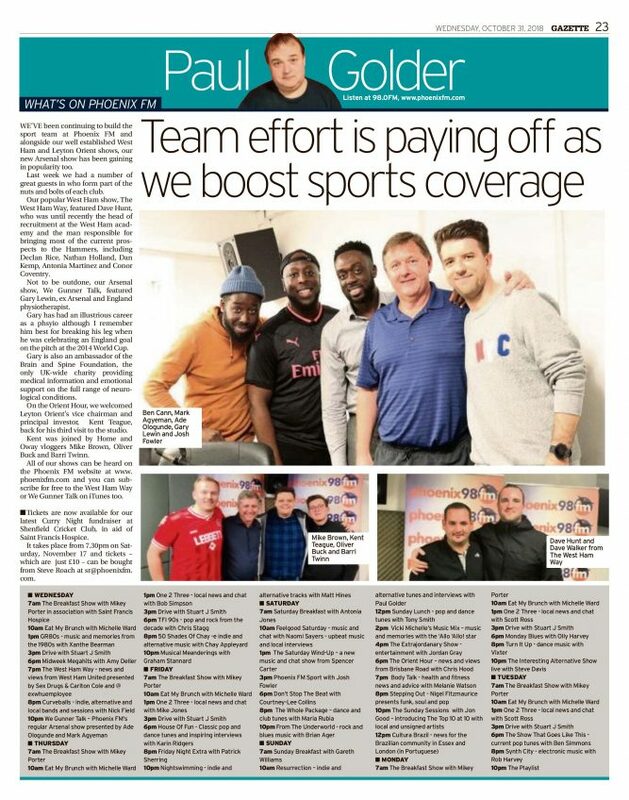 We’ve been continuing to build the sport team at Phoenix FM and alongside our well established West Ham and Leyton Orient shows, our new Arsenal show has been gaining in popularity too. Last week we had a number of great guests in who form part of the nuts and bolts of each club. Our popular West Ham show The West Ham Way featured Dave Hunt, who was until recently the Head of Recruitment at the Academy and the man responsible for bringing most of the current prospects to the Hammers, including Declan Rice, Nathan Holland, Dan Kemp, Antonia Martinez and Conor Coventry. Not to be outdone, our Arsenal show We Gunner Talk featured Gary Lewin, ex Arsenal and England physiotherapist. He has had an illustrious career as a phsyio although I remember him best for breaking his leg when he was celebrating an England goal on the pitch at the 2014 World Cup! Gary is also an ambassador of the Brain & Spine Foundation, the only UK wide charity providing medical information and emotional support on the full range of neurological conditions. On the Orient Hour we welcomed Leyton Orient’s vice chairman and principal investor Kent Teague back for his third visit to the studio. Kent was joined by Home and Oway vloggers Mike Brown, Oliver Buck and Barri Twinn. All of our shows can be heard on the Phoenix FM website at phoenixfm.com and you can subscribe for free to the West Ham Way or We Gunner Talk on iTunes too. ** Tickets are now available for our latest Curry Night fundraiser at Shenfield Cricket Club, in aid of Saint Francis Hospice. It takes place from 7.30pm on Saturday 17 November and tickets – just £10 – can be bought from Steve Roach at sr@phoenixfm.com.